These weighted versions of the Newstead Cutlery range feature a heavier handle that is particularly suitable for users who suffer from conditions such as hand tremors. Newstead Weighted Cutlery...These weighted versions of the Newstead Cutlery range feature a heavier handle that is particularly suitable for users who suffer from conditions such as hand tremors. 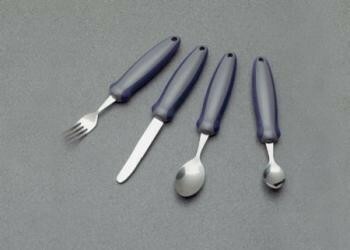 The Weighted Cutlery is available to purchase individually or as a set of four. Individual weight 130g. Set weight 520g.